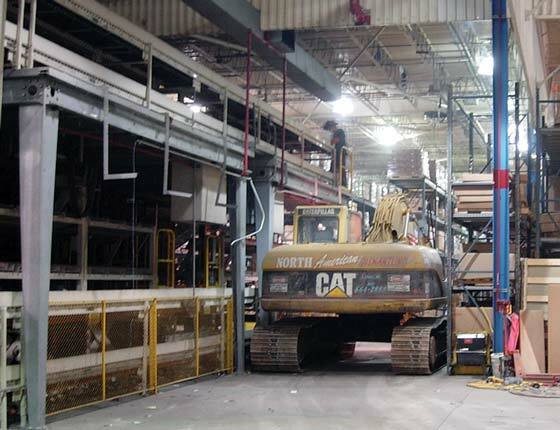 Strip Out | North American Dismantling Corp.
Warren Transmission Plant, Warren, MI – This project consisted of final clearing of approximately 440,000 square feet of process area located in General Motors Corporation’s Warren Transmission Plant. Over the years the plant went through many changes without any prior removals. The United States Navy and the Hudson Motor Car Company constructed the facility in 1941 for the manufacturing of various types of artillery and shells. The facility was subsequently owned by Westinghouse and Ford Motor Company, before it was purchased by the Chevrolet Motor Division of General Motors in 1961. From 1961 to 1974, the facility was used to manufacture automotive parts and artillery shells. From 1974 to July 1980, Chevrolet continued automotive manufacturing operations. The Hydra-Matic division of General Motors began operations in 1980 and continues to produce transmissions and various other automotive parts to this day. It was the task of North American Dismantling to finally clear out all the old and redundant systems that had been collected over the years, including electrical, mechanical, fire protection, heating and ventilating, and security systems. There were absolutely no as built drawings available to assist North American Dismantling in this endeavor. Several of hundreds of hours were spent identifying and labeling the systems that were to remain and those that were to be removed. American Dismantling removed all old equipment structural members, u-bolts, and hangers connected to roof trusses in all areas. Additionally, North American Dismantling removed 45,000 square feet of wood block flooring, 56,000 sf of concrete pavers, and 244,750 sf of non-monolithic concrete (including topcoat, concrete pads, concrete curbs, and equipment foundations). The wood block flooring and brick pavers were removed and disposed of as regulated materials and the areas below scarified to received new concrete topping. North American Dismantling also removed several hundred feet of 48” round duct work, which covered an area of approximately 200,000 sf from the existing roof. North American Dismantling completed the asbestos abatement of pipes, heater units and HVAC units located in the truss of the buildings. North American Dismantling also completed the environmental cleaning of all pits, sumps, flooring and trenches in all areas. In addition to our original contract work, North American Dismantling was awarded the removal of approximately 12,000 sf of existing oven from the roof area. The ovens were contaminated with non-friable ACM. In Addition, North American Dismantling received the proper 40 hr training that was needed to remove the ovens. The roof, roof panels, and side panels of the Elpo Oven were double wrapped with 6-mil poly and disposed of as ACM. The remainder of the oven was removed as non-hazardous metal and debris. Because of the high flammability of the roof, North American Dismantling, in conjunction with the Plant Fire Marshall, purchased four plasma cutters and trained its employees to complete these operations.